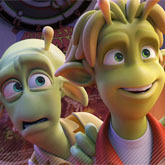 Who is developing Planet 51? Pyro Studios develops the game. The publisher is Sega. Shouldn't Eidos be publishing the game? No. Eidos has sold all it's shares in Pyro Studios, thus losing the publishing rights. On the 26th of February 2009, Pyro Studios announced they partnered with Sega as their new publisher. Which platforms is the game being developed for? The game will be developed for the PS3, Xbox 360, Wii and Nintendo DS. The PC and PSP versions of the game were cancelled for unknown reasons. I heard a CGI movie is in the making based on this game. It's the other way around really; the game is based on the movie. Ilion Studios, founded by the owners of Pyro Studios, started production of the movie in 2004. The game is available worldwide on all platforms. Are the same voice artists from the movie featured in the game? This would be very likely, but this has yet to be confirmed or denied. Is Planet 51 the brand name? Yes, it has been registered as a trademark by Ilion Studios. The project was previously called Planet One, but our guess is that the name was changed due to legal issues. The main charcters are NASA astronaut Captain Charles "Chuck" Baker and the young Planet 51 inhabitant Lem. In the game you play as these and other protagonists. Is there anything known about the storyline? Nothing specific, but it will no doubtly follow the same story as the movie. See our storyline page for further information. Who will compose the game's soundtrack? The game's score is once again provided by Mateo Pascual. Questions about his involvement in this project were raised after Matt Biffa and Erin Scully were credited for the music at the IMDb website. Pyro Studios has ensured us that Mateo hasn't been left out. Good news for his fans! Look around TAFN. We have gathered as much information and media to take a look at. If you still haven't gotten an answer go to the TAFN forums and ask us, we will then add your question to the FAQ.